Hollow metal doors and frames are used in commercial, industrial and residential buildings all over due to its durability and security. 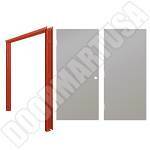 Doormart USA supplies a range of commercial hollow metal frames and doors for various purposes. Fire rating option is available all of our doors and frames. Whatever your requirements are, you are sure to find the right combination for all your needs. We stock knock down frames and welded frames. Our standard commercial knock down frames and welded frames are manufactured from galvannealed steel and are prepared and reinforced to receive specific architectural hardware in accordance to ANSI A115 Standards. 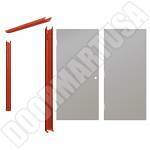 Our Knock down frames are available in 16 gauge for 1 3/4" doors. 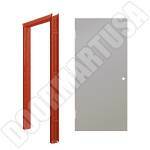 Our welded steel frames are available in 16 and 14 gauge for 1 3/4" doors. 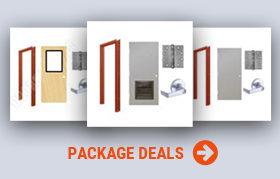 Our standard commercial hollow metal doors are 1 3/4" in thickness and are available in 20, 18 and 16 gauge. Door skins are mechanically interlocked vertically along the hinge and lock edge. Door edges are beveled 1/8" in 2" and door surfaces are flush and free of any joints welds or seams. They are prepped for either mortise, cylindrical or spider prep and are reinforced for surface mounted door closers. In addition, we stock seamless, 6 panel, double strike and you can choose to add louvers or vision lite kits with wire or tempered glass installed.